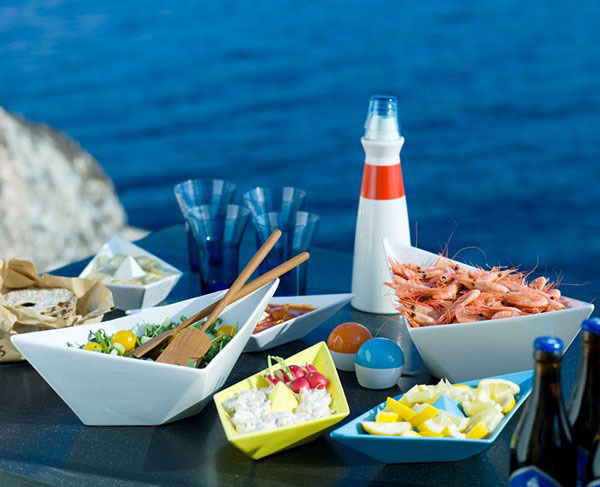 Nautical themed dinnerware sets in white and blue colors are great for creating nautical theme party table decoration. White and blue color combination, creative table decoration ideas and elegant dinnerware sets evoke pleasant memories of warm sun, light white clouds on the sky and blue waves in summer. Paper Boat Tableware sets are beautiful nautical theme decorations that add charm to summer party table setting. 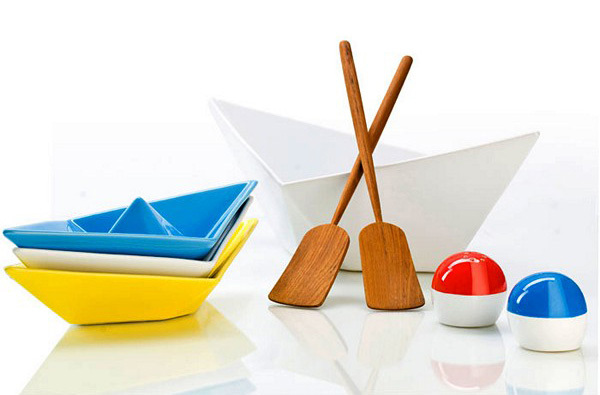 Colorful Paper Boat tableware sets look contemporary, but familiar and nostalgic. Bright yellow, white and blue color combination celebrates the nautical decor theme and make your party table decoration ideas feel festive, welcoming and warm. Happy yellow, striking white and cool blue color combination with unusual and playful dinnerware sets design create a gorgeous party table, add adventurous mood and romantic flavor to unique and striking nautical decor for your party table. Paper Boat Tableware sets from Sagafoam, www.sagaform.com/ are excellent nautical themed party table decorations. Modern tableware sets include paper boat shaped dishes, saucers and bowls in various sizes in yellow, white and blue colors. Paper boat shaped dishes and paddle-like wooden spoons make nautical themed party table look interesting and unique. Lighthouse oil and vinegar bottles design and buoys-like shaped salt and pepper sets with red color accents make bright and charming nautical themed party table decor. Everything from drift wood and rustic boat items to marine life and beach pebbles fits the nautical theme and makes spectacular nautical theme decorations. 1. Use new or fake fish netting for creating a centerpiece that emphasizes nautical theme party table decorations. 2. Decorate the table top with tiny plastic toys, – anchors, fish, shells, lobsters, seahorses, crabs, octopuses, whales and dolphins, turtles and starfish. 3. Make or buy nautical flags for individual centerpieces. You can hang them from the ceiling or across the walls to highlight nautical theme party table decoration ideas. 4. Scatter sea shells, beach pebbles, dry sea weeds or small amount of beach sand. 5. Add miniature lighthouses, tall ships, driftwood crafts and lanterns.